Most of the tower, nave and western chancel are probably late pre-Conquest, possibly incorporating earlier work. 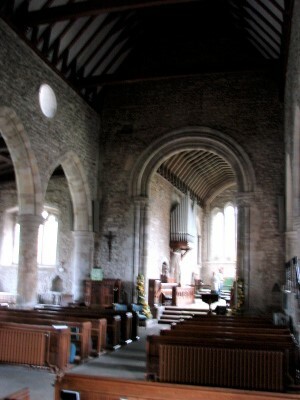 The chancel arch and middle chancel are late C11 and the aisles early C13. The chancel reached its present length after 1220 and the south aisle was rebuilt in the C14. There were lesser changes in the C15. 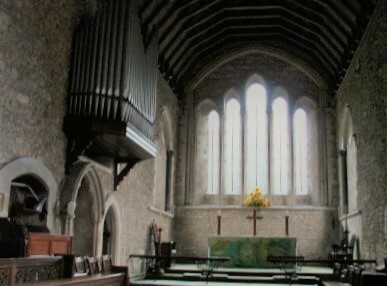 Bosham church has attracted much fanciful speculation, starting with the belief that it is Roman in origin (e g 7 pp5-6). Unsurprisingly in view of the presence of Roman buildings nearby, the fabric does contain re-used Roman masonry, but that is all, though pottery found on site in 1865 was thought to be Roman (3 p85). 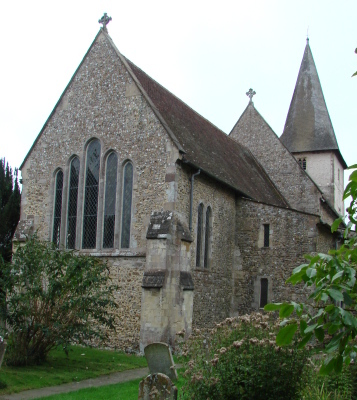 However, Bosham is closely associated with the coming of Christianity to Sussex. When Wilfrid arrived, he established himself on royal land at Selsey, which has a boundary with Bosham, where according to Bede, Wilfrid found Scottish (i e Celtic) monks under Dicul. It is unlikely that a ruin known as St Bede’s chapel in 1637 (VCH 4 p187) was linked, though the name may reflect later interest. Bosham became a minster and by the C11 its lands are said to have extended as far as Funtington (Dallaway I p87). It may have lost some in the mid-C11 to Earl Godwin and his sons (5 p33), who had their seat here. The church is shown in schematic form on the Bayeux tapestry, when Harold embarks at Bosham on the journey during which he fell into the hands of Duke William. King Edward the Confessor granted the church to one of his chaplains, Osbern, who was a Norman by birth and later Bishop of Exeter. He held it in Domesday Book (6, 2) and a successor, William Warelwast, in 1120 endowed a college of six secular canons, with the bishop as dean. This lasted until 1548 (VCH 2 p110), using the chancel of the church, whilst the nave was parochial. The Bishops of Chichester and Exeter were in dispute over jurisdiction until they agreed that the parish came under the see of Chichester, but that the college was exempt. The collegiate buildings south of the church are said to have been pulled down in 1840 (Lower I p66), though it was probably some years later that Hussey (p203) noted a Perp doorway which he believed was part of the college. Re-used masonry that clearly comes from the college is visible in some houses. 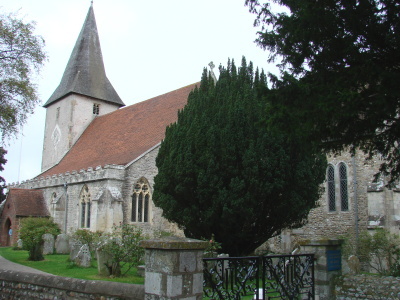 The church is one of the most celebrated in Sussex, mainly because of its manifest or presumed pre-Conquest features, and has been studied by Fred Aldsworth (twice) Richard Gem and, most recently, Tim Tatton-Brown (see 1, 2, 5 and 10). All have questioned traditional datings, though they are by no means unanimous. The first question is the date of the nave, tower and western chancel. 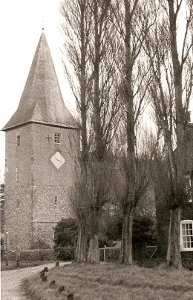 Most earlier authorities ascribed them to the late pre-Conquest period, including the Taylors (p81), but Gem believes that parts could be C7 or C8 (5 p35) and Michael Hare (MA 16 (1972) p163 and more fully in unpublished works) has suggested the lowest part of the tower belonged to a possibly earlier C9 two-storeyed annex. This would be compatible with Gem’s further suggestion that the tower was originally a west porticus (thereby explaining the lack of a doorway to the outside); he also raises the possibility of totally vanished north and south porticus. Despite these divergences of dating and interpretation, there is effectively a consensus that the dimensions and thus the plan of the nave date from this first phase of building. Only excavation could show if Gem’s suggestions were correct, though as the floor level of the nave was lowered by 2ft in 1865 (7 p12), the evidence may have been destroyed. If the nave was as early as the C7 or C8, it would be larger than any in the south east to survive from such an early date. The dimensions sit more comfortably in the C11 and though features like the visible change in masonry above the tower arch could be interpreted as dividing two phases of building, the interruption need not have been long. The upper side walls are 2ft 6in thick and there is long-and-short work in the west quoins, both signs of late Pre-Conquest work, though the south side was rebuilt in the C19. Aldsworth also found long-and-short work during repairs to the quoins of the tower in 1988 (see 1). The openings are problematic; the round-headed ones in the lowest stage to north and south only are too broad to be pre-Conquest. Those of the next stage, above a string-course (missing to the west), are narrower and could be altered originals, though Aldsworth believes they are later (ibid pp66-67). Above a further string-course, the third stage has double north and south openings and a single west one. The south one is hidden by a clock and the north one has lost its centre shaft (and now contains a modern opening), but they are original. David Parsons (in his contribution to SAS conference on early mediaeval churches in Sussex, 14 May 2011) linked at least some of the external openings to the existence of a gallery for the display of relics, similar to that postulated for Deerhurst, Gloucestershire and Eric Fernie has suggested that there could have been a tribune for a magnate (4 p5). Inside, high on the west wall of the nave is a round-headed opening, which the Burrell Collection drawing (1782) shows in the open above a lower-pitched roof and over the outline of a triangular opening and what looks like a squint. Possibly they signify accommodation for the priests in the tower or suggest there was a wooden gallery facing into the church; evidence that there were hinges in the triangular opening suggest it was a doorway (7 p15). By analogy with continental examples, Clapham (p95) posited a west gallery for an altar, which was prevented from being on the ground by the presence of the tower arch. This hypothesis would be less likely if the tower originated as a porticus, as the altar would have been within this. More recently doubt has been expressed about Clapham’s hypothesis on the grounds that there is little evidence for balconies or galleries in such a position (e g by Helen Gittos in her contribution to the SAS conference) and David Parsons has suggested that the upper doorway led to a large chamber, which extended over the nave above a flat ceiling. In contrast to Gem, Aldsworth concluded that the three lower stages of the tower were an entity, most likely linked to the nave. The plain abaci and large squared stones of the responds of the tower arch are consistent in date, but the neat voussoirs of the round head, though they are through-stones, led the Taylors to suggest later rebuilding (ibid); Aldsworth accepts there were two phases, both of them early (1 p62). Tatton-Brown suggests the head was altered soon after the Conquest (10 p131). The chancel arch has been widely seen as a key late pre-Conquest work, but in line with current thinking, which stresses continuity around the Conquest, Gem (see 5) in 1985 dated it to c1070. Whilst acknowledging the archaic imposts and bases, of super-imposed rings of different sizes, he noted the similarity of the attached columns of the jambs and the heavy roll-mouldings on the head to work in Normandy of this date. Returning to the question of its date in c2004, he states that ‘its inspiration is thoroughly Norman’ (Studies II p728). However, the archaic features he had noted earlier make it unlikely that a Norman mason was responsible, especially the mouldings and capitals. He concluded that the most likely date was c1090 at the earliest and attributed it to the patronage of Osbern. This seems rather late and unless further evidence comes to light, it seems unlikely that a closer dating than the final third of the C11, as suggested by Eric Fernie (4 p4) is realistic. The arch is by any reckoning remarkable, 22ft high, though with a slightly deformed head, and is related to that at Stoughton, though the capitals there are more developed. Support for Gem’s belief that the nave is earlier, perhaps significantly so, comes from the way the arch appears to have been inserted in an older east wall, as the outline of a square-headed opening above and a smaller one to the north show – their original purpose is unknown; Fernie is, however, inclined to see the present east wall and the arch as built at the same time (4 ibid) and does not offer an explanation of the openings. It is tempting to link them with David Parsons’s hypothesised chamber over the nave, but in any case it is not easy to disregard them and the balance of evidence at present suggests that the new arch was inserted in the existing wall with the intention of improving access and visibility between the existing nave and chancel. Parts of a north window and a blocked round-headed south doorway show the chancel as far as the first buttress belongs to the first structure. The Taylors (p82) suggest it had an apse as it is otherwise disproportionately short, whereas Tatton-Brown (10 p132) believes it was square-ended. Here too, excavation might give the answer. About the same time as the chancel arch, the tower received a new top stage and probably the lower openings were enlarged. A weathered corbel-table at the base of the new stage resembles contemporary work at Chichester cathedral. The corbels could have been reset (2 p118) or even have been brought from there. The top stage has two-light openings. The west one, like the chancel arch, combines archaic and new features. Its recessed round central shaft is pre-Conquest in form, but not the capital. The chancel was too short to house Warelwast’s new college. It was therefore extended before 1120 by what is now the centre section, which shows some herringbone masonry, though all the detail is later. 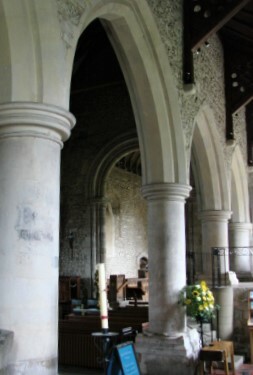 In the late C12 aisles were added to the nave. Their date is best shown by the north one, which has a roll-moulded doorway and a round-headed west lancet. Signs of jambs below the sill inside show the latter has been altered and the pointed rere-arch may also be a later alteration. The four-bay arcade has round piers on spurred bases, one of which also has a grotesque head; because the floor has been lowered, they are unusually high. The differently coloured voussoirs are randomly arranged and there are three circular clerestory openings. The suggestion in the VCH that these are pre-Conquest (4 p187) is unlikely. The superficially similar south arcade is usually given to the same date, though the aisle itself appears all C14. Tatton-Brown sees the arcade as C14 as well and does not conclusively answer the question of whether there was an earlier aisle. Whilst admitting that the arcade was rebuilt in the C19, he points to the C14 style profile of the capitals (10 p135), but as these are renewed, they cannot be trusted. The overall form of the south arcade is so similar to the north one that it is much more likely there were two aisles from the late C12. Both are laid out at an angle to the earlier work, accentuating the irregular plan. In fact, as Godfrey pointed out (6 p109), the tower and the original chancel are more accurately aligned, though the lengthening of the latter has emphasised an inclination to the south. At the same time, the middle parts of the previously square imposts of the chancel arch were chamfered with stops that are typical of the period. The final change to the groundplan was the further lengthening of the chancel in the early C13. The new part has paired side-lancets and five stepped east ones above a roll-moulding and in addition a pair of lancets was placed in the C12 middle section. Externally plain, the marble shafts of the rere-arches contrast with moulded heads in lighter stone. The three centre shafts at the east end are freestanding and the outer ones support a stilted arch framing the whole composition. The side walls show redundant head-corbels for the original roof. 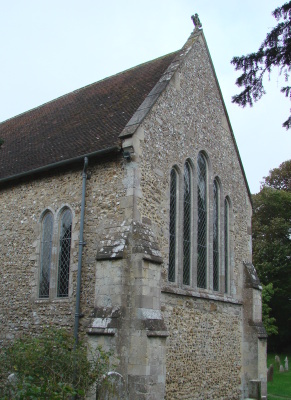 Similar but more modest work is found elsewhere in the area, e g Appledram (then a chapelry linked to Bosham), suggesting Chichester cathedral as the ultimate source. However, Eric Fernie (4 p5) and Tatton-Brown (10 ibid) see closer parallels with Salisbury, which would suggest a date after its start in c1220, but geography supports some Chichester involvement unless relations between the two bishops were so bad as to rule out participation by the cathedral masons. A two-storeyed north vestry is also C13, but possibly later (ibid p134). Its simple upper openings are largely original. Most aisle windows are C14 in style, though too restored to be reliable, unlike the moulded south doorway and, probably, its door. The walling of the south aisle consists largely of Mixen stone, from a reef off Selsey Bill (ibid p153). Taken with other differences, like the roof and lack of a clerestory, this shows the C14 rebuilding of the south aisle was thorough. This work may have been connected with the founding of a chantry to Thomas, Earl of Norfolk (d1338) (ibid p136), which was probably in the upper part of a two-storey structure at the east end of the aisle. Its higher platform, above a low rib-vaulted chamber, is reached from the aisle by a narrow stair. Probably built as a treasury or charnel house, the lower chamber is now a chapel. To allow for the platform, the east respond and first pier of the arcade are shorter. Changes to the north aisle comprised three windows with ogees and quatrefoils in the heads, which look reliably restored. In the C15 the roofs were replaced by lower pitched ones and the Burrell drawing, Adelaide Tracy (1850) (I p11) and Nibbs variously show the east gable with its pitch unaltered and the outline of the old roof against the tower. Dendrochronology shows the timbers of the broach spire were felled in 1405-06 (2 p115), when probably the three bell-openings in the top stage were altered. After such extensive work, a bequest of 3s 4d for the belfry in 1533 (SRS 41 p170) was probably for repairs. The early C16 segment-headed east window in the north aisle can date from little earlier. Changes after the Reformation included the largely brick C17 or C18 south porch and probably at the same time, the doorway was repaired in brick. The Sharpe Collection drawing (1804) shows the windows of the south aisle and others blocked. C19 works began with repairs to the spire in 1841 (10 p137), but were pursued with greater energy by H Mitchell, who was vicar from 1845 to 1902 and wrote about the church (see 8). His campaign of restoration lasted 20 years – in 1852 (Eccl Aug 1852) he was said to be restoring the church by degrees. Already in 1845 J Butler (Leeney p127) re-opened the south aisle windows and gave them C14 style tracery. He claimed that the east window was derived from one at Oundle, Northamptonshire and also renewed the roof, whilst retaining the heavy battlements above. He may have done some later work, though by the time of the restoration of the north aisle windows in 1862, he had left the district. In 1863-65 (BN 12 p418), at a more thorough restoration, E Christian replaced the main nave roof at the original pitch and stripped the interior of plaster. This revealed the earlier phases of construction, but the rubble walls were not intended to be seen and wall-paintings were lost (Peat and Halsted p43). Christian also rebuilt the south arcade with much new material (Leeney p131), probably including the walling above, as well as lowering the floor. In the chancel, he inserted openings to the north for the organ and to the vestry. A traceried opening over the chancel arch and a new south porch were unbuilt (Leeney p128). There was a further restoration in 1903 under J B Colson (B 85 p85), though his partner N C H Nisbett actually did the work (BN 94 p301). This appears to have been limited to the tower (ibid), though it was initially intended to undertake work more widely since the church is said to have been ‘in sad need of restoration’ (Architects’s Magazine, November 1902 – my thanks to Martin Jones for this reference). Work cost £2600 (BN, ibid), a substantial sum, but despite the renewal of some stonework, particularly of the bell-openings, it was done with a light touch. Later additions include J L Denman‘s clock of 1951 on the tower, placed after a dispute that had lasted since 1946 (BAL/MSS DeJ/1/3-4). The churchyard gates and the adjacent wall were the last work of G Wornum in memory of his daughter who drowned in 1950, as an inscription records. Aumbry: (North aisle under north-east window) Plain and rectangular. 1. (In tower) Six C12 fragments with chevrons, of unknown origin, which were probably put here after 1912 (see 9). They could be from the church or college or elsewhere and recall Chichester work of c1125-50 (www.crsbi.ac.uk retrieved on 1/4/2013). 2. (North aisle, built into the wall by the north west window) A further fragment of Caen stone with palmette decoration. The dating is uncertain, but Tweddle (Inventory p127) suggests the mid-C11. Bench end: (North chancel) Incorporated in the C19 stalls is one C15 end with a figure curved almost horizontally along the top, which probably comes from the canons’ stalls. Chest: (South chancel) C13, with an elaborate triple lock. Font: Late C12 shallow marble arcaded bowl. Unlike the usual type, it is octagonal. The centre pier and four corner-shafts are conventional. Glass: (South east aisle window) Four fragments of C15 glass showing angels are said to be from Norwich cathedral (BE p112). Mass dial: (North aisle, reset under west window) Originally outside at the east end, it was reset in 1973, according to an inscription. 1. (North side of chancel) Late C14 cinquefoiled tomb niche, containing a battered female effigy. This may have been placed originally in a now vanished window niche like those on the south side. 2. (Nave floor) A plaque of 1906 records the finding of a stone coffin in 1865 (8 p7), thought to have contained the body of King Canute’s daughter who, according to a tradition not found before the C18, was buried here. The C14 effigy in the chancel has been associated with her, but on stylistic grounds alone this can be ruled out. 1. (South of chancel arch for the parish altar) Triangular-headed, of uncertain date. 2. (South east angle of south aisle) Much restored C13 trefoil-headed with a shelf. 3. (East end of north aisle) Early C13 trefoil-headed with rounded lobes and with a drain in a pillar set in the wall. This could be part of an early C12 pillar-piscina, which must have been reset and may originally have come from the first extension of the chancel (www.crsbi.ac.uk retrieved on 1/4/2013). 4. (South chancel) Plain pointed with a mutilated bowl. It marks the position of the canons’ altar before the chancel was extended in the C13. 5. (Under south east chancel window) C13 double piscina, each half of which has a roll-moulded trefoil head, separated by a short shaft with a foliage capital. Recess: (By south doorway) It has a slight ogee-head and is cusped, with a head at the end of each lobe. It looks C14.